It was a pretty crazy hockey night tonight. From the scene in Montreal regarding Jean Béliveau's memory to the Jets dismantling the Dallas Stars to a scary hit which sent Keith Ballard to the hospital, the emotional roller coaster was in full effect tonight. I have to admit that I got a little misty-eyed when I watched Mrs. Béliveau break down as they played the memorial video about her husband. That was a moving moment in hockey if there ever was one. However, the image to the left is not some Malkin-to-Avalanche joke. It's actually a pretty big accomplishment for #71 as Borna Rendulic became the first Croatian-born player to play in an NHL regular season game tonight! The 22 year-old winger appeared tonight against the Nashville Predators, adding his name to the record books for being the first of his country's kind to play in The Show! 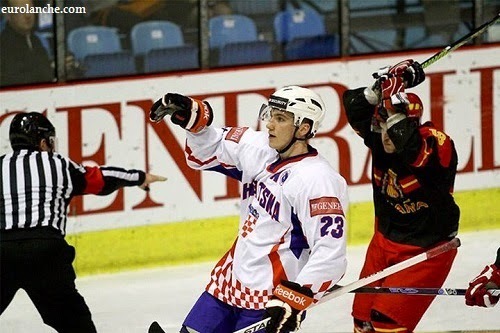 Rendulic wasn't very well-known outside the borders of Croatia when the Avalanche signed him over the summer. First, as an introduction, his name is pronounced "REN-duh-LITCH". He appeared in a number of IIHF tournaments for his country in both the junior and senior ranks. He is actually quite an accomplished scorer from his time in international junior tournaments. In 24 World Junior Championship games between 2008-12 in both Division-I and Division-II, Rendulic scored 18 goals, added 18 assists, and had 10 penalty minutes. Add in his Under-18 World Junior Division-II tournament numbers in 2008 and 2009 where he played 10 games total scoring 10 goals, adding eight assists, and sitting for four penalty minutes, and Redulic appears to be Croatia's best young player ever. The scary part? He was 16 in 2008, and recorded seven goals and three assists in the Division-II World Junior Championships! Ok, so he's a pretty solid player from his statistics in international tournaments. You might be asking how Rendulic fared against professional players. At 15, he joined Croatian club Zagreb Medveščak in the Croatian Ice Hockey League. He played a couple of games, picking up two penalty minutes, but had no points. Would you expect a 15 year-old to score against men who are five-to-fifteen years older than him? Probably not. He played two more seasons with Medveščak in the Slovenian Hockey League in 2008 and the Austrian Hockey League in 2010, appearing in 14 games and amassing two goals, one assist, and two penalty minutes. Again, Rendulic was only 16 and 18 years-old at this point, so it's not like he was even close to being a man yet. The fact that he notched a few points in a couple of professional European leagues at that age is still impressive when you consider that there hadn't been many Croatian-born players to make an impact in the game of hockey at that point. 2009 saw Rendulic play internationally for Croatia at three tournaments: the above-mentioned Division-II World Under-18 Championships, the Division-II World Junior Championships, and the Division-I World Championships! He played five games with the men in the World Championships, scoring a goal and adding two assists while sitting for two minutes in the sin bin. He didn't play professionally in 2009, but let's not forget that he either was in the process of graduating high school. There aren't many high school kids - or any kids, for that matter - who are ready to take a major step, but Rendulic wasn't done there. In 2011, Rendulic junmped to the SM-Liiga of Finland, their top hockey league, as he suited up with Ässät for three games, posting clean scoresheets. He moved down to the Mestis, Division-I hockey in Finland, for the remainder of the season, suiting up with SaPKo for seven games. It was here that he found the scoresheet, posting two goals and three assists with 14 penalty minutes. SaPKo would miss the playoffs that season, but Rendulic was starting to get comfortable as a scoring threat. 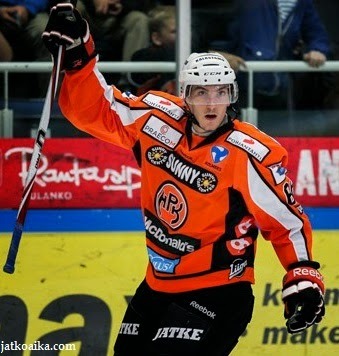 Rendulic would return to the SM-Liiga with HPK in 2012, appearing in 37 games. He posted eight goals and four assists in his first full season in the Liiga, being shuffled down to Division-I for just five games mid-season to appear with Peliitat. With Peliitat, Rendulic scored two goals and two assists, prompting his promotion back to HPK as the team battled for a playoff spot. They would qualify for the playoffs, playing in five games that season. Rendulic would tally one assist in the playoffs that season, but he had made enough of an impact for HPK to bring him back the following season! HPK was probably glad to have him back as Rendulic played 57 games for them, amassing 11 goals and 21 assists along with 34 sin bin minutes. He helped the squad to 10th-place in the Liiga and a wild card berth against Jokerit. HPK won two-straight games against the 7th-place Jokerit club by scores of 5-1 and 3-2 to advance to the best-of-seven quarterfinals against first-place Kärpät. The games against Kärpät were far closer than most imagined they would be, but Kärpät ended up sweeping HPK out of the playoffs. The scores in those games were 3-1, 1-0, 3-2 in overtime, and 4-0, so HPK did quite well despite finishing 22-26-9-3 (W-L-OTW-OTL) on the season, and some 44 points back of Kärpät. Rendulic scored three goals and added a couple of penalty minutes in the six games played. His play prompted a few NHL teams to take notice, and he received two firm offers from NHL clubs: the Nashville Predators and the Colorado Avalanche. Rendulic obviously signed with the Avalanche from the photo at the top, but the reasons had a lot to do with Joe Sakic, who is of Croatian descent, and Avalanche Director of Player Development David Oliver. Described by former HPK teammate Jere Sallinen as a "good cook and a lousy EA Sports NHL player", Sallinen spoke fondly of his former teammate to Thomas Krauskopf of KHL.hr. "He's amazing. He's an excellent skater, a funny guy off the ice. He's got a pretty good pass, and of course, he's scoring a lot when we were playing in the same team. He's a funny guy, I like him." Pretty good endorsement, right? 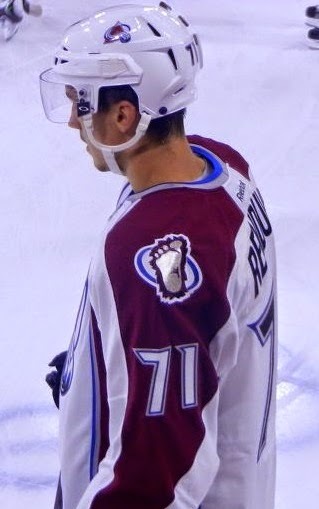 And on December 9, 2014, Rendulic became the first Croatian-born player to suit up as his Colorado Avalanche played host to the Nashville Predators. Well, on Rendulic's first shirt, just 2:23 into the game, a miscue on the Avalanche side gave Nashville rookie Filip Forsberg a breakaway which he converted to put the Predators up 1-0 and give Rendulic his first stat: a -1. He would play nine more shifts in the game for a total of 7:47 in ice-time with one shot-on-goal and the -1 rating to his name as the Predators shut out the Avalanche by a 3-0 score. While he probably won't remain with the Avalanche this season, his time in the AHL with the Lake Erie Monsters has been fruitful. In 21 games, Rendulic has recorded four goals and three assists for the 10-8-4 Monsters thus far. He's signed for two years, so we could still see Rendulic become the first full-time Croatian-born player in the NHL, but only time will tell if he'll take that next step. From the way his progression has been trending, he looks like he's on-track to be an NHL regular soon!